Let me first tell all the mothers watching, Happy Mother’s Day, I hope you enjoyed your special day. 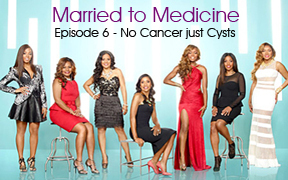 Thanks for tuning in once again to Married to Medicine. This week’s episode was full of Real Women, Real Issues, Real Life Drama. Tonight we open with Quad and Mariah going at it in the tranquility suite. It was crazy. “Calgon take Me Away!” I was so worried that women in their trying to relax would be offended but luckily only a few were in there at the time and most women at the conference never knew what happened between the ladies. But at the moment the tranquility suite definitely became the toxicity suite. I really hate that Quad and Mariah are having such challenges with their friendship. The pain runs so deep with both of them. I believe that if Quad and Mariah really take time to hear the other person’s point of view they may be able to one day work through their differences. However, like I said this show is about Real Women, Real Issues, Real Life Drama! “Hurt People, Hurt People,” and that is exactly what is going on with Quad and Mariah! On a positive note Toya and Simone make up. The words “I’m sorry” are so powerful. These two words can be so liberating and allow the healing process to begin. It warmed my heart to see them hug and tell each other how they were both really feeling. Afterall, that’s what the WEN conference is all about. WEN is the premier conference for women looking for their breakthrough. Be Empowered, Be Inspired, Be Transformed at WEN. For more info on the 2014 WEN conference, please visit www.wenwomensconference.info . So as we leave the tranquility suite we return back to the lunch panel discussion and Dr. Heavenly crashes my panel. Who does that? Like I said before Dr. Heavenly is unpredictable and her actions on this episode are exactly what I’m talking about. In case you didn’t see it in my face, I had no idea what she was about to say or do. At that given moment of course security was standing by and ready but I decided to “kill her with kindness” rather than go off and my intuition was right. Dr. Heavenly is really a nice person….a little crazy at times but a good person. She likes to stir the pot but at her core she does want the circle of friends to stay in tack, as do most of us. In the end, my friends had a great experience at the WEN conference. I wish Mariah and Quad would kiss and make up but honestly speaking that’s going to take more than WEN….that’s going to take an act of God. So for now the circle of friends is more like a semi-circle and there is more to come of the Mariah/Quad saga so keep watching. Next we see Jackie and Simone talking at Jackie’s office. Jackie writes Simone a prescription for “Shut Your Mouth” 3 times a day. Hilarious. I love the friendship between Jackie and Simone. They hold each other accountable for crazy behavior. That’s what real friends do. Real friends tell you what you need to hear, not what you want to hear. Simone definitely had a moment in the tranquility suite with Toya and she definitely needed that prescription. Dr. Jackie, I am loving watching you this season. I appreciate how transparent you are being and how you are sharing with us how much you want a baby. This episode really made me realize how blessed I am to be a mother of two beautiful children. I think as women we sometimes take for granted the blessing of being able to have children. Jackie, Lisa is your prayer warrior and I’m going to pray you get that baby. Keep the faith and know it will happen if you just believe and like the lady from the agency said “It’s nurture not nature” that creates the connection between a mother and child. You are going to be an amazing mother! Now, its time for me to face the music…and deal with these cysts. I can’t put it off any longer. Watching this episode made me realize how blessed I am to have a supportive husband and team that holds me up when I get weak and have challenges. Carolyn is more than an assistant; she is my friend and sister. And my husband, there are no words to describe how blessed I feel to have him as my life partner. He is my husband, best friend, protector and more. I was able to get through this because he was by my side encouraging and supporting me. I am so thankful that the outcome was NO CANCER, JUST CYCSTS. Thank God. God answers prayers. What a relief! Life is precious. At any moment, things change without notice. Embrace life and live it to the fullest because TOMORROW is not promised. Live, Love, Laugh and Enjoy Life! We close out this week with Quad and Recco at the fabric store. Quad is seeing that fashion design is not always so glamorous. It’s important to get in the trenches and learn every aspect of building a clothing line. Quad is doing just that and I believe her puppy couture line is going to do very well. She is turning her passion into profits and that makes entrepreneurship even more fulfilling. What a surprise, Quad and Recco disclose that Mariah is renting her house. How interesting! Why would a “millionaire business women” rent her house?